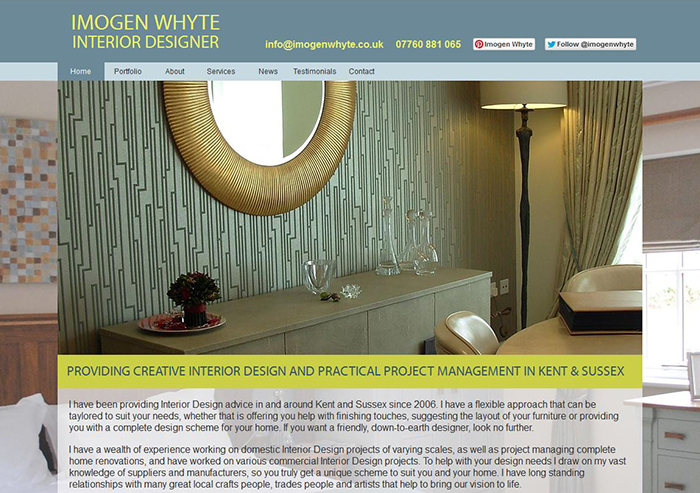 To create a user friendly website to show examples of Imogen Whyte's Interior Design Portfolio. Also required was the ability to upload images, add news articles and images as well as testimonials. Additional support was given on improving search engine rankings. The repeating pattern for the background of the website was done in Illustrator then tweaked in Photoshop. The rest of the websites elements were designed in Photoshop and constructed using Dreamweaver, phpMyAdmin, and Notepad++. I was very impressed by ICM Studios straightforward approach to designing and building my website. I supplied a brief description of what I was wanting and felt it was interpreted well, producing a clean and efficient website. I have found the admin section very easy to use which makes it quick and simple to keep things updated without having to pay for further alterations. I would recommend ICM Studios to anyone wanting a friendly, affordable and efficient service.